Adidas® soccer cleats are designed having a lockdown fit and air-light sense of control and quick actions throughout play. Start your season right and get a brand new set of adidas® soccer cleats for males, ladies and youth gamers alike. adidas® soccer footwear are crafted for the overall game, made with a number of innovative technical features to boost your speed and agility. Lightweight combined uppers deliver perfect touch and control. Pre-molded sock inserts provide maximum padding and support, while rear-feet mesh adding provides needed protection throughout your most difficult games. Show your competitors you've arrived at play. 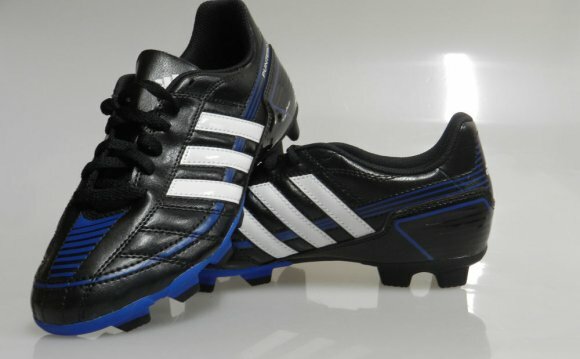 adidas® soccer cleats and footwear can be found in a number of dynamic hues and fashions. Your adidas® shoe construction should enhance the rules of aerodynamics, traction and ball discuss the pitch. Sports athletes who experience firm ground should search for footwear with non-removable rubber or plastic cleats to supply control and footing on quick cuts. Soft-ground cleats are made for wet, muddy natural surfaces and have both plastic and detachable metal studs. These studs are usually longer for additional traction. Extra space is incorporated between cleats to prevent dirt clumping. Your soccer footwear are equipped for a narrower fit than your street and running footwear. This narrow fit provides better ball feel and control around the pitch. Leather soccer cleats mold for your ft once you put on them, delivering a custom-like fit that enhances touch. Synthetic soccer footwear don't require a rest-in period. Turf gamers should seek adidas® soccer footwear with short rubber studs which cover a sizable part of the outsole, permitting for convenient controlling and traction on artificial grass. Indoor soccer footwear, meanwhile, resemble regular athletic shoes however with a complicated traction pattern across the surface. Mark Schwartz is a retired American soccer forward who played in the United Soccer League and the third American Soccer League. He was the 1984 USL Rookie of the Year.